What is the Mikki Tick Picker? A simple and easy tick removal system, the Mikki Tick Remover is specially designed to remove ticks from cats and dogs painlessly, easily and effectively. 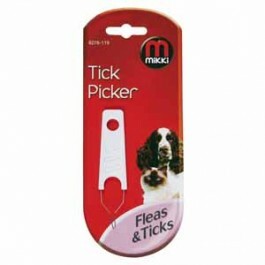 With many tick removers, the head can remain attached to the cat or dog, but the Mikki Tick Remover, due to its unique design, removes the entire tick, reducing the risk of infection. What are the benefits of using the Mikki Tick Picker? Easy way to remove ticks from your pets’ coat. Help keep your pet looking their best. How do I use the Mikki Tick Picker? To remove the tick, position the picker over the tick with the tick in the largest section of the picker, nearest the handle (below). Lift the handle so that the narrow nose of the picker is flat on the skin. Draw the picker slowly and firmly towards the tick so that it is gripped securely and can be carefully lifted away from the skin and disposed of. Please Note:Use smooth movements when lifting the tick. Ensure that there are no traces of tick’s head or mouth–parts left on or in the skin. Pets should be checked daily for ticks; their immediate removal would minimise the chance of transmitting disease.